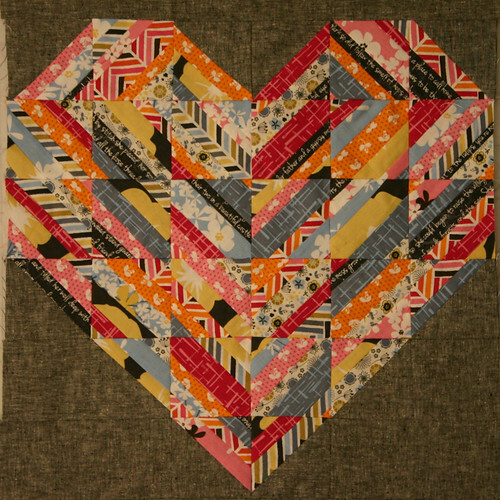 String blocks are a great way to use up scraps, and my recent quilt finish, The Road to Love, incorporated two different kinds of string blocks that made a heart shape when put together. 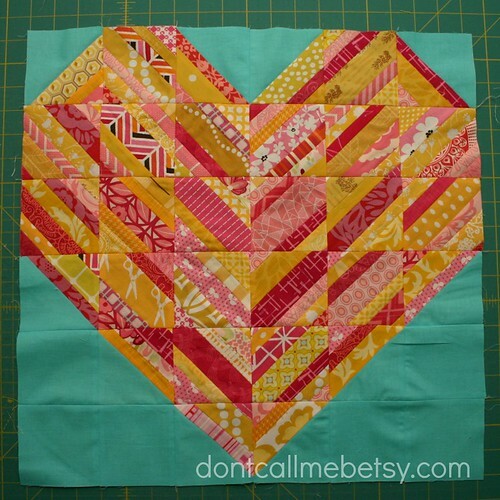 This tutorial will walk you through making one string heart block, which you can then either repeat to create a quilt full of string hearts, or you can use lots of negative space around the heart, like I did. 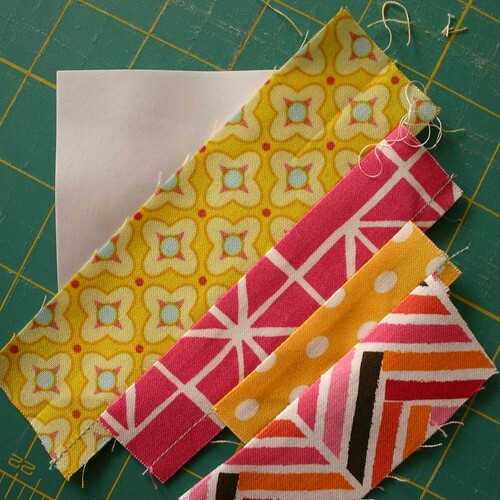 When I make string blocks, typically I choose to use paper as my foundation, as it's easily removable, and I prefer to use standard copy paper or printer paper, as it's cheap, easy to get my hands on, and easily trimmed to the size I need. 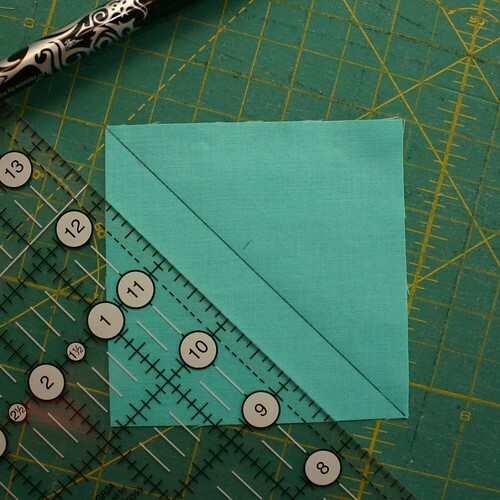 1) To begin, set your machine's stitch length to ~ 1.5mm. 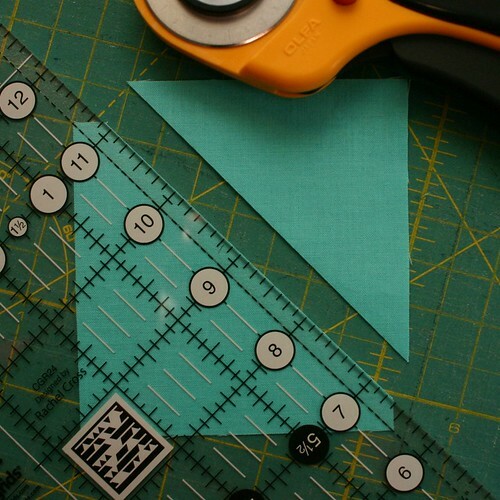 This will perforate the paper you're sewing through for easy removal. 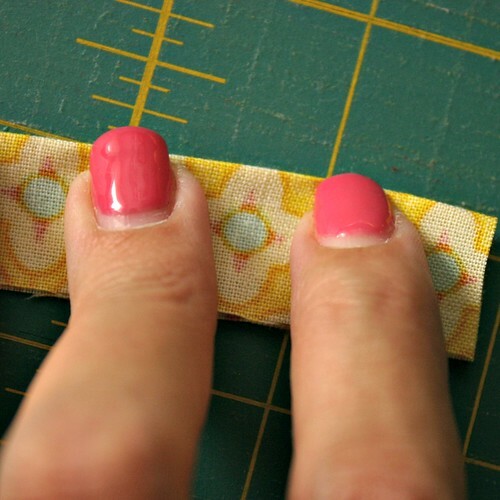 2) Take one long string and fold in half lengthwise, creating a crease with your fingernails at both ends. 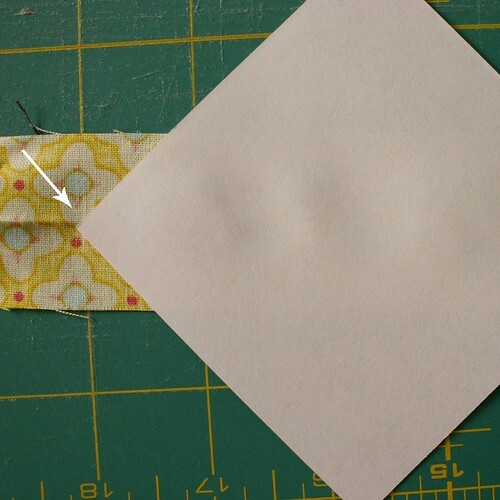 Align that crease with the center of one of your paper squares, and use a dot of glue to hold in place, right side up. This is the only string we will place right side up. 3) Next, take another string and align the raw edges with the glued string, right sides together. The string should hang off your paper square slightly. Sew in place, using a scant 1/4" seam. 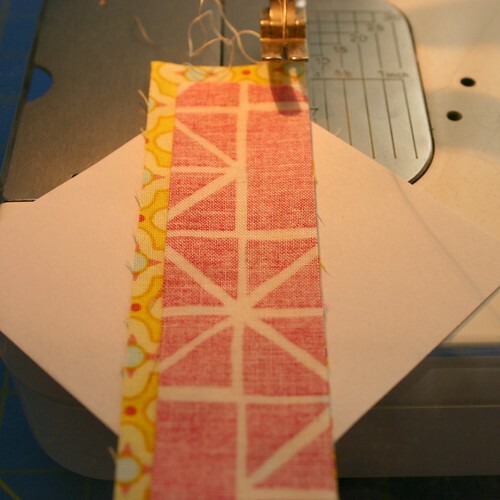 Press the seam over, using a hot, dry iron. 4) Select another string from your pile and repeat step 3, aligning with the new raw edge, and sew in place. Press, and repeat until that side of your square is full of strings and the paper on that side is completely covered. 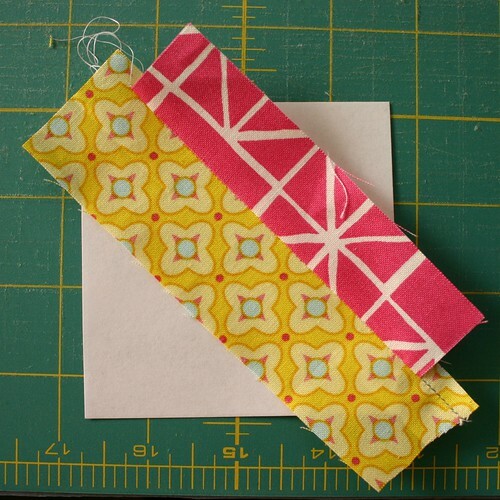 5) Repeat for the opposite side of the first string, until the entire paper square is covered by fabric. 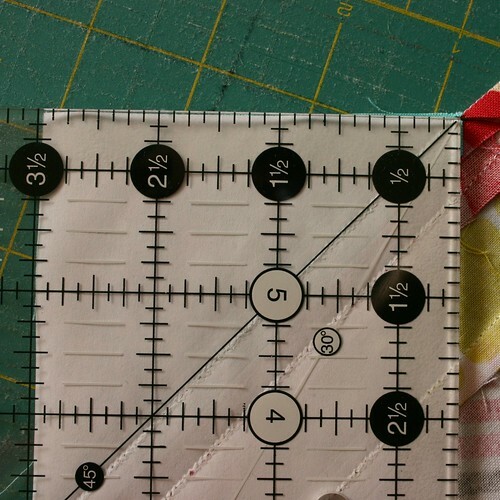 6) Trim square down to 3 1/2", aligning your ruler with your paper square and trimming away the excess fabric. Remove the paper by folding back and creasing along each seam and pulling at the paper. 7) Repeat steps 1-6 to create a total of 20 string blocks. 1) Block B is a traditional Roman Stripe block. 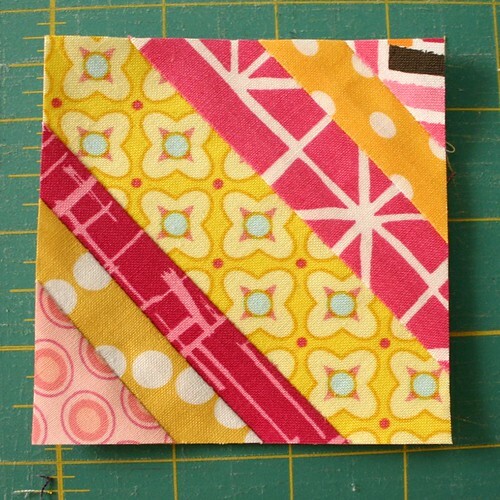 First, you'll need to cut (10) 3 1/2" squares from your background fabric. Once your squares are cut, on the right side of the block, use a Frixion pen or Hera marker to mark the center diagonal of the square. Measure 1/4" from that marking, and trim the excess. 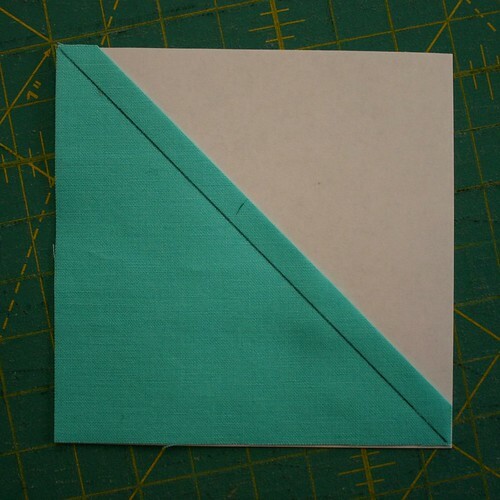 Glue this odd triangle to one of your remaining paper squares, taking care to line up the edges. 2) Next, align one of your longer strings right sides together with the raw edge of the odd triangle and sew in place, using a scant 1/4" seam. 3) Press seam over with your fingernail and set with a hot iron. The hot iron will remove your Frixion mark, should any of it be showing. Continue adding strings to this square as we did in Block A until the square is full. 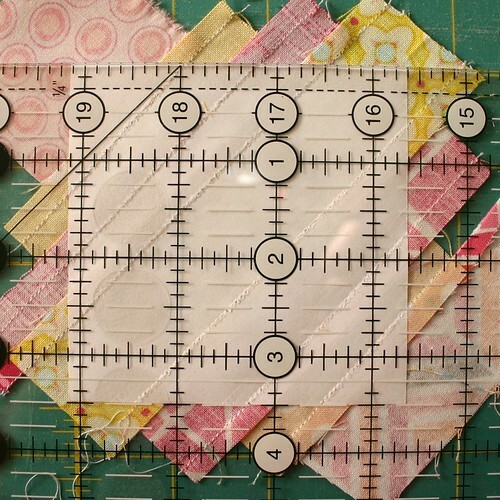 4) Trim square to 3 1/2", aligning your ruler with the paper square, and repeat to create a total of 10 Roman Stripe blocks. 1) To create additional movement and visual interest, we'll place the string blocks in such a way that the center of the block creates a herringbone effect. 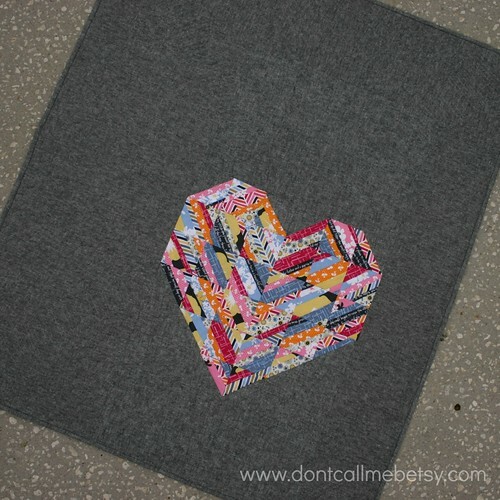 Follow the photo below to place your blocks in the heart shape. Move your blocks around until you're pleased with the layout. You'll notice I've got one square in the fourth row from the top that's out of place. 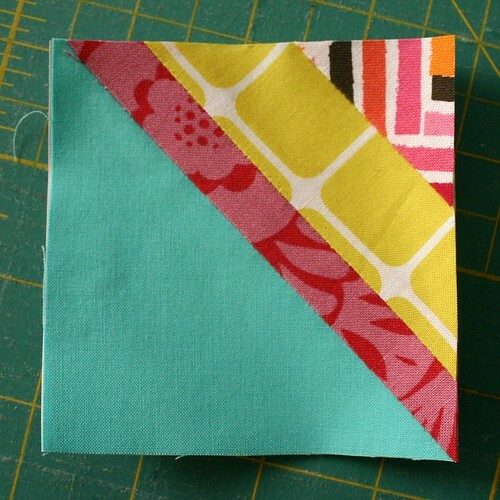 2) Next, sew each row of blocks together, taking two at a time and pressing the seams open as you go. 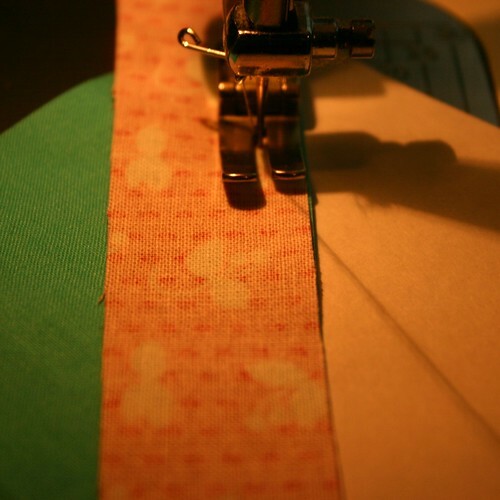 3) Join the rows together, press seams open, and you'll have a completed heart on your hands. Feel free to pin this tutorial! I'm definitely Pinterest friendly :) If you'd prefer to save a PDF copy of this tutorial, you can download one from Craftsy right here. I hope you enjoyed this tutorial! If you make something using this tutorial, please be sure to add it to the Stitching with Don't Call Me Betsy Flickr group. Over the weekend, I got to share my finish for the Madrona Road Challenge at the monthly meeting of the Tampa Modern Quilt Guild. It was a lot of fun to see all of the fantastic projects the guild members made, there were quite a few members who participated, so it was very exciting. We did a vote on all of the projects shown at the meeting, as well as two that couldn't make it, and I'm proud to share with you my entry, which won the challenge. I'm positively in love with how this quilt came together. I've hung it up in my sewing room over my sewing table and every time I look at it, I can't help but smile. When I started on this project last week, my only plan was to let loose and have fun, not to do something super intricate, but to put something together that would make me smile. 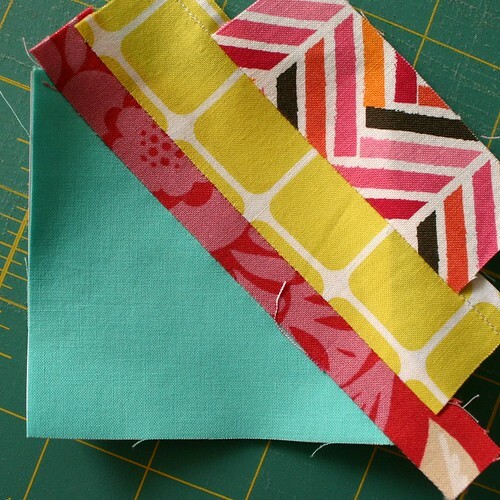 I started by cutting my fabric into strips and putting together some string blocks. Then, I decided I wanted to use some Essex Yarn Dyed in Black for the background fabric, so I put together a few Roman Stripe string blocks to use as half-square triangles. 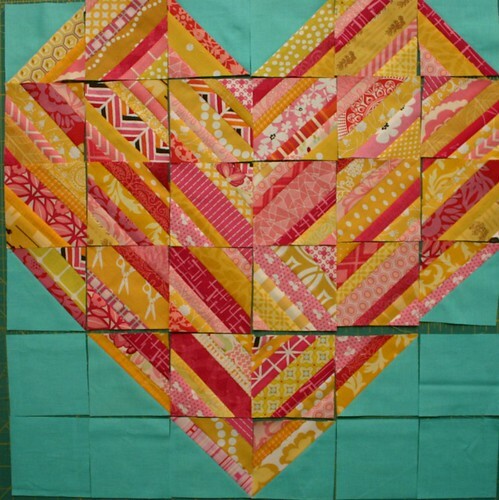 As I played with the layout of my blocks, I kept thinking about the pixelated heart quilts I've seen and loved recently, so I decided to go with a heart layout. Once I put it up on my design wall, I was happy with it and I felt like I had a direction. 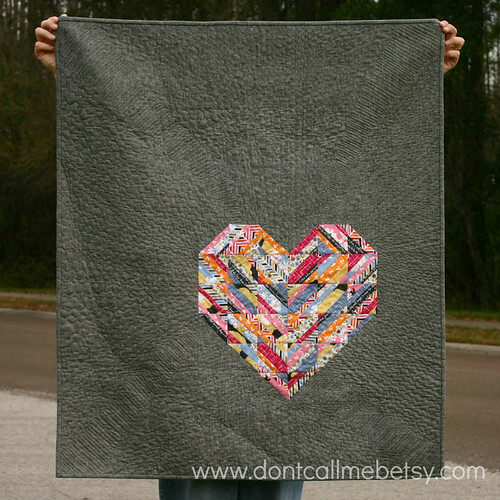 I wanted lots of negative space, for fun quilting, and to the piecing of the heart truly shine. 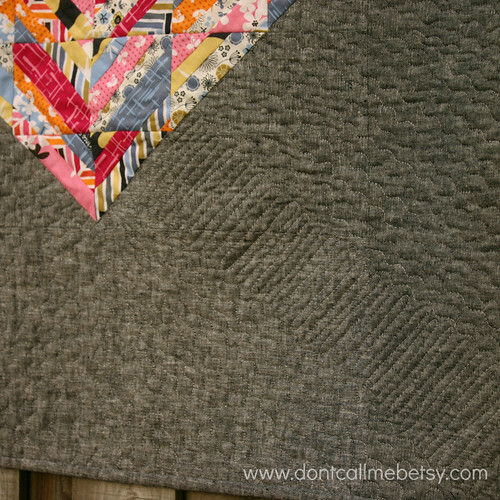 For the quilting, I chose a gray variegated thread, which blended really nicely. 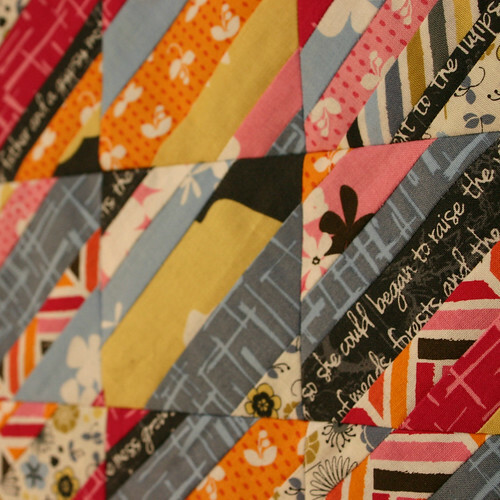 I quilted using both wavy lines and wiggle back and forth lines to give a sense of movement to the quilt. I like how the stitches really blend into the Essex in a way, but a part of me wishes I'd chosen a color with a little bit of contrast so I could see the stitches a little bit better. And speaking of my weekend, I did my first real interview over the weekend, with quilty podcaster Katie of Katie's Quilting Corner. 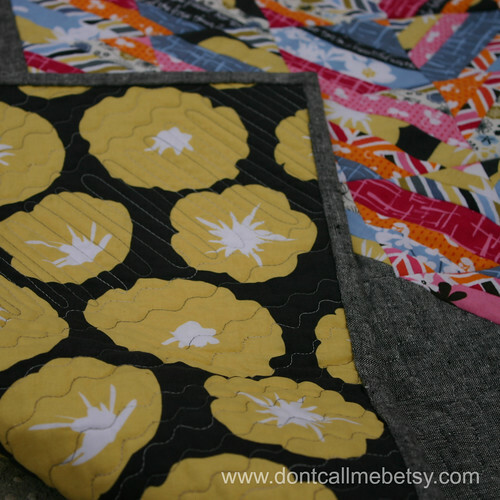 If you haven't listened to Katie's podcast before, she shares projects she's working on, things she's learned, as well as interviews with other quilters periodically. I was super flattered when she asked me to do an interview with her, but I have to say, in spite of my nerves, she really made me feel comfortable and I enjoyed chatting with her. 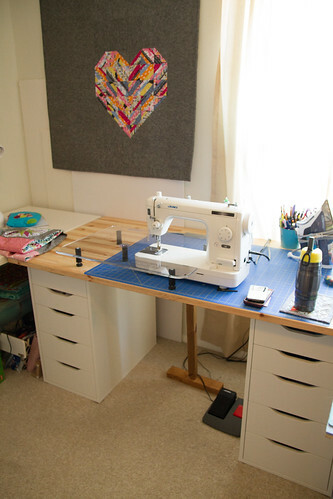 You can find a link to listen to it right here, along with tons of pictures of my sewing space. There's nothing like the last minute, right? I finally got to work on my Madrona Road challenge quilt, and the only thing I knew I wanted to do when I got started was have fun! So that's exactly what I've been doing for the last few days...in between blowing my nose and sneezing, that is. I'm fighting a nasty cold at the moment, but I'm hoping that I'm on the waning end of it at this point. The good news is that I'm definitely going to manage to finish up my quilt in time for our guild meeting this weekend, where we'll be wrapping up the challenge. I'm excited to see what everyone has made! Have a wonderful weekend!